This is an awesome give away and a good start to welcome the new year! A group of bloggers had joined in to host this fabulous give away. Lots of exciting prizes awaits the lucky winners. Thirty winners will take home these exciting pieces of jewelries. So what are you waiting for? Join now and be a part of this event! About our sponsor: Penny Auctions Canada, as our name implies, is an online auctioneer providing a value driven alternative to retail shopping. Our live auctions are best described as the fusion of an online retail store and a thrilling shopping experience designed to save you both time and money. Our daily auctions offer HUGE savings to both the Canadian and U.S. market on the latest electronics, popular gift cards, highly desired housewares, plus much more. Our next step in the evolution of entertainment shopping is to take place in late January. We will be upgrading our site to offer more ways to win and more ways to save. With daily deal auctions coming we will be able to offer stunning jewelry for prices you can’t find anywhere on the web! From the rugged and long lasting pieces made from Tungsten, Titanium or Stainless Steel to beautiful 18K GP pieces made with Swarovski elements. There will be something for everyone. And that’s just the start! We will be adding new products regularly to keep your senses enlighten and your money where it should be, with you! Our lovely sponsors want to offer THIRTY of you a chance to win a beautiful piece of stunning, quality jewelry! Wait, did we say thirty of you? YES WE SURE DID! Penny Auctions Canada is awesome! Be sure to visit their site, and get signed up for awesome prices and great giveaways. Check out all this fabulous jewelry listed below. 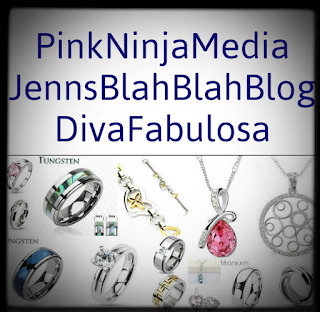 There is 30 pieces of awesome jewelry for 30 wonderful winners total value is MORE THAN $2000! Winners will be drawn according to the value of the prize. For example, our grand prize winner will be the first person picked by random.org. The 1st winner that is drawn will receive the tungsten ring value at $139.99. We will then move right and continue with the 2nd person drawn receiving the tungsten ring valued at $129.99, and continue down the line until we have reached all 30 winners. If you have any questions please contact Jenn at info@pinkninjamedia.com. 30 Lucky Winners Will Receive a Wonderful Piece of Jewelry. Giveaway is open to the United States and Canada. Please use the Rafflecopter to enter. This fabulous giveaway begins on January 10 at 12:01am EST will come to an end on January 31, 2013 at 11:59pm EST. Good Luck! Disclaimer: This blog is not responsible for shipment of prize, nor did I accept any form of compensation for my part in the giveaway. All opinions are 100% my own, based on my own experiences This giveaway is in no way associated with Facebook, Twitter, Pinterest, or Google. This event is open to those residing in the United States and Canada. No purchase necessary. Must be at least 18 years of age to participate. For full disclosure see the Rafflecopter. 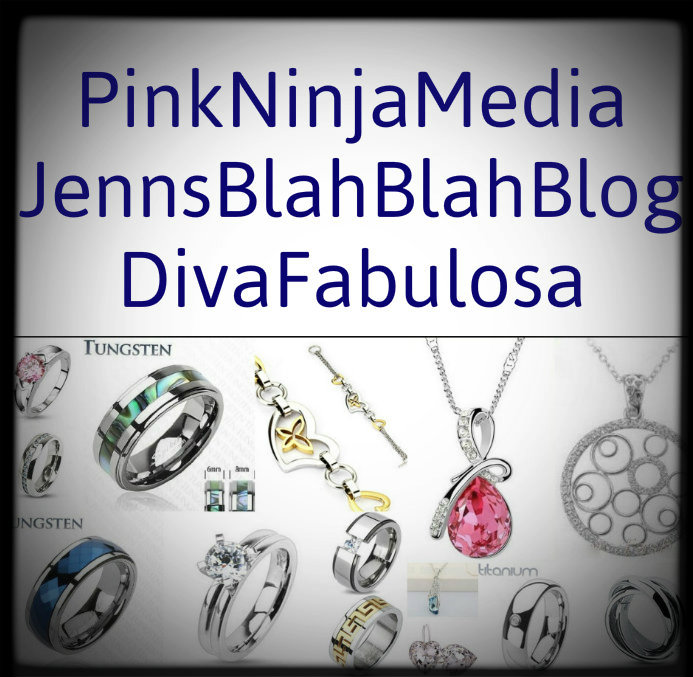 If you have any questions please email Pink Ninja Media at info@pinkninjamedia.com.